The best party games have simple rules and allow for quick and easy set up. Endless Games has come up with some great concepts for multi-player board games that would suit any gathering, large or small. Encore and Name 5 are both quick to learn and simple to set up, making them perfect for your next party. One of Endless Games' most enjoyable party board games is called Name 5. Players pull cards to determine a category, and then they must come up with five items, names, or titles to fit the category. Game inventor Brian Turtle, who is one of the three founders of Endless Games, likes that Name 5 isn't intimidating for players, saying "It covers every category under the sun. Movies aren't your thing? No sweat, maybe the next round will challenge you to name five breakfast cereal mascots. Don't like The Beatles? Not a problem. You have to name five TV dads." "That very broad spectrum of content gives everyone a platform to showcase their area of expertise, while the fact that you can usually come up with one, two, or three answers in most categories makes the game fun for everyone and lowers the intimidation factor," Turtle adds. Name 5 comes with a game board, question cards, dice, tokens, and a 30-second timer. The rules encourage two teams of two or three players each, though you could easily play individually with two to four players, or with a larger group. Teams take turns rolling the die and moving tokens along the game board. The spaces on the board are colored to coincide with colors on the question cards. When a team lands on a colored space, the other team reads them the coinciding question. Once the question is read, the team has 30 seconds to give five correct (or appropriate) answers. There are also special spots on the game board that give teams opportunities to face off against each other, or allow teams to chose their own category. The game is recommended for players aged 12 and up. Name 5 is simple to set up and play without a lot of complicated rules. Players can get right into the action and start thinking up answers for the questions they're faced with during play. Individual play can be tricky, since not all individual players will have the experience and knowledge necessary to tackle all of the diverse question topics. The game is recommended for team play for this very reason. The really fun thing about Name 5 is that the rules are open to interpretation depending on how many players you have and how strict you want to be. You don't even really have to use the game board. Says Brian Turtle, "I rarely leave the house without a stack of Name 5 cards and have been known to challenge folks in a bar, on the bus, in line at the grocery store, or just about anywhere! If you are ever approached by a Name 5 wielding stranger, it might just be me. I mean you no harm. Play along. You'll like it!" The wide range of questions included in the 288 game cards ensures that there will be many topics that most players can confidently answer. 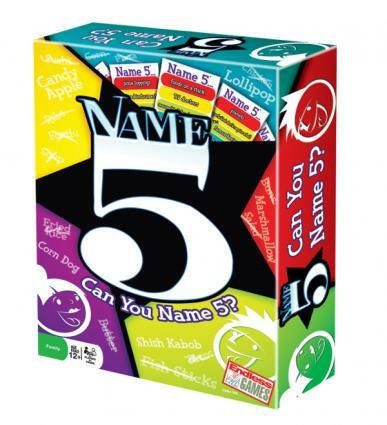 Whether you're playing the game with a small group or using the cards as an ice-breaker for a large gathering, Name 5 is appropriate and fun for just about any group of people. 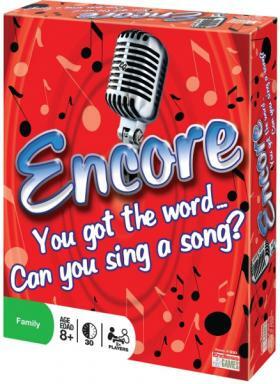 The Encore board game plays out like some of the sing-a-long game shows that have popped up on television like The Singing Bee or Don't Forget the Lyrics. The twist here is that you are supplied with a word, and then must sing a verse from as many songs as you can think of that contain that word. The game is intended for at least two players, though if you have a large group you can play in teams. Encore comes packaged with a game board, three tokens, dice, a 20-second timer, and a set of game cards. Much like Name 5, spots on the board are linked by color to words on the game card. When a player lands on the board, the color of that spot is used to determine which word on the card will be used for that round. Once the word is read, the player who landed on the spot must sing a few words from a song with that word in it. The word doesn't have to be in the title, just in the lyrics. Then the opposing player(s) get a chance to come back with a different song that includes the same word. Players go back and forth until it seems like they are running out of songs. At that point, any of the players can take the 20-second timer and start it, challenging the other player to sing an appropriate song before time runs out. Though the suggested age for Encore is 8 years and up, it's best to play against those in a similar age bracket or with close family and friends who have been exposed to the same music. There are generational differences when you have only a few players in a wide range of ages, and many of the players won't know all of the same songs. The other drawback to Encore is that it forces players to sing out loud, and many people may not be comfortable with this aspect. These points aside, Encore is another game that is easy to pick up and play without a lot of complicated rules. The words range from simple ("love" and "heart") to a little trickier ("magic" or "blue"). There are a lot of laughs while playing! Brian Turtle says that this is his favorite from the Endless Games catalog, and adds that games like this "make great ice breakers and have all been used in school and corporate retreats as team building and confidence exercises. They would also make for great ice breakers for use at other 'reception' style events where not everyone knows each other." According to Turtle, "Endless Games was founded in 1996 by Kevin McNulty and Mike Gasser. Kevin and Mike had previously worked together at Selchow and Righter where they helped launch Trivial Pursuit in the US; and at the Games Gang - notable for being the company that introduced Pictionary to the world. They were looking for the 'Next Big Hit' to build Endless Games on, and found me - Brian Turtle - and my game The Six Degrees of Kevin Bacon." The three founders have been working together ever since and have come up with a wide variety of board games for all age ranges, including titles based on game shows and interactive board games for children. To check out their line of games, visit EndlessGames.com. Thank you to Endless Games for providing copies of Name 5 and Encore for review.